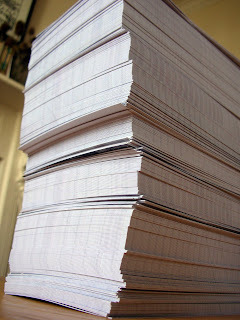 Ever wondered what a pile of 500 postcards would look like? Here is the answer! 500 brand new Lapwing Printworks postcards ready to go in with our orders and to be given out willy-nilly. Ordering them is something we've been meaning to do for a long time, and we're so pleased we took the plunge because they look great! 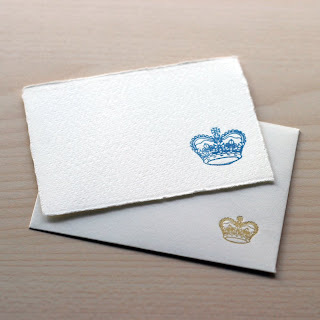 This is another letterpressed card from last week's efforts - a teeny, tiny card with a dark blue crown. The envelopes have a smaller, matching gold crown on the front. I love these ones, they strike me as being rather Regency somehow - perhaps I was being influenced by flicking through Pride and Prejudice looking for quotes for the Pemberley cards. Now available in our shops - and with the added incentive of a Lapwing postcard! Today has been hot and muggy again, and attempting to work in a deckchair in the garden didn't result in much work being done... Tonight we are harvesting our very first courgettes for our tea, which is very exciting, but I'm making myself wait until Jon gets home from work so we can pick them together (seeing as he does all the work, and I just reap the benefits). 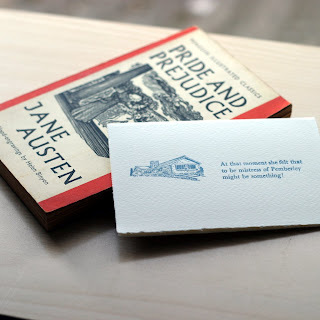 This week we letterpressed some notecards with a quote from Pride and Prejudice paired with a vintage 1960s block of a bungalow. 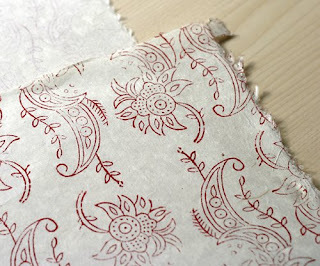 I love this block, and have a whole raft of ideas on how to use it in various little projects. We printed sets of the Pemberley cards in various summery shades (pink, blue, light green, lilac and peach), and they were snapped up from our stall at Clutter City yesterday. Clutter City was good fun - but hot! 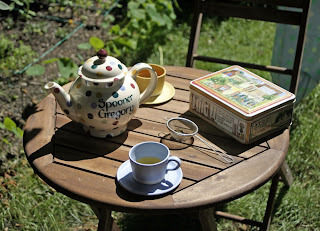 Today we've been sitting in the garden reading and trying to keep cool. This week I printed several more sheets of wrapping paper too which look brilliant - but too nice to use? 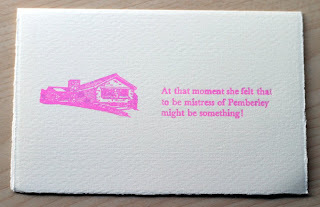 The remaining sets of Pemberley notecards are available in our Etsy, Dawanda and Folksy shops now. Come and see us this Saturday! 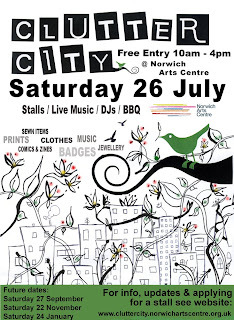 We will be having a stall at Clutter City at Norwich Arts Centre from 10 to 4. We are busy getting ready at the moment, so expect all manner of printed and letterpressed stuff. If you're in Norwich then come along and say hello! 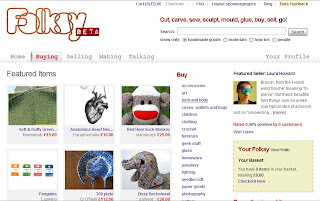 We have also set up a new online shop at Folksy, a new craft and design website. This means that we can now list our prints in £££, which is brilliant! 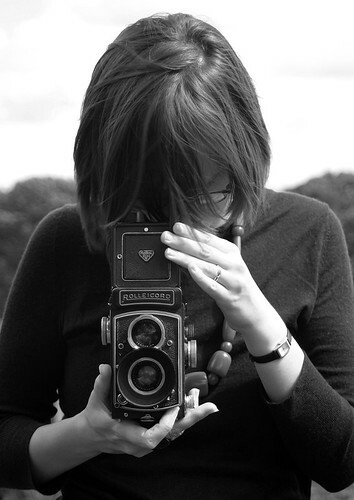 The site is still in its testing phase, but there are already plenty of lovely UK designers and crafters on there. You can find our Folksy shop here, at the moment there are only a few prints in there but we will be adding the rest over the next couple of weeks, as well as some new stuff! 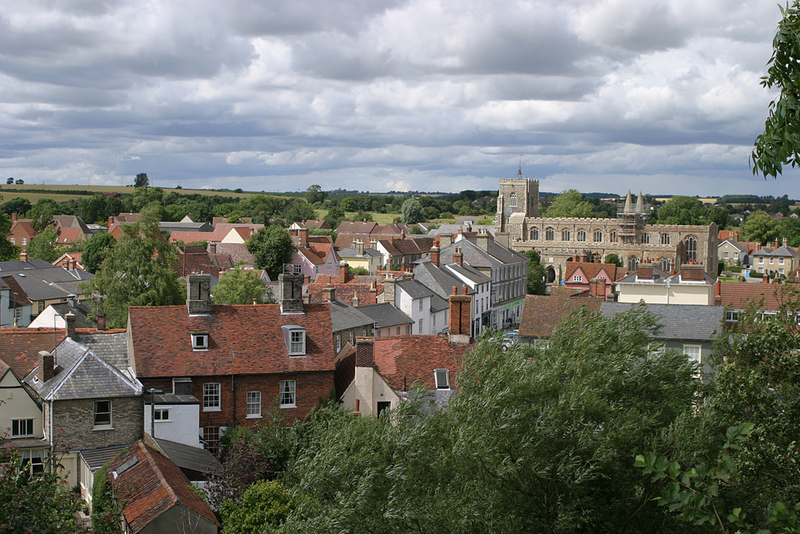 We explored the very pretty village of Clare (where we took lots of photos with the Rollei on the windswept castle motte) and pottered about in Sudbury, including a good poke around in Gainsborough's House which has a very nice print studio. If only it wasn't an hour and an half drive from our house... We also went to visit Celia Hart's studio, which was open to visitors as part of the Cambridge Open Studios scheme. We love reading Celia's blog, purple podded peas, and it was lovely to have a good chat with another printmaker. We spent the long drive back to Norwich discussing all the prints we want to do in the next month or two. Today we have been busy wrapping prints ready for the Clutter City market in Norwich next weekend (more on that another day), so expect lots of letterpress related posts this week as we get ready to stock our little stall! 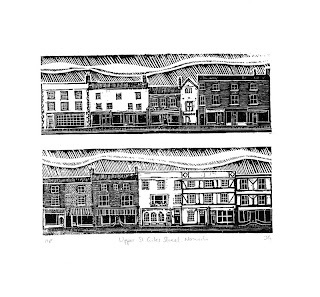 For a long time I've been planning to do an engraving of St Giles Street in Norwich, one of our favourite places to go on a Saturday morning. Last summer I took photos of all the buildings down one side of Upper St Giles, and over the winter turned these into a pencil drawing. This then formed the basis for the wood engraving. Rather than try and find a very long and thin block I decided to engrave the street in two sections, one above the other. I used a 4 x 3 inch block, with each row of buildings just over an inch high. Here's a picture of the block in progress (the lines in the middle were to help get the buildings roughly to scale with each other). When it was finished we printed it on the Adana 8x5, with mixed results! We did a few of the whole block, and then some using just one half with the other masked off. It was printed using Lawrence oil-based letterpress ink on Zerkall paper, and after about an hour of trial and error we eventually managed to start turning out decent prints. This was the first time we've used oil-based inks for ages. We always hated the cleaning up afterwards - too many nasty chemicals and black stains in the bath. We've found a good routine now though, using a small bottle of "Zest It" and a pile of old black socks to get the rollers, pallette knives and inking slab clean. Here's a print of the whole block. Prints in various combinations will be turning up soon on our Etsy, DaWanda and Folksy shops. 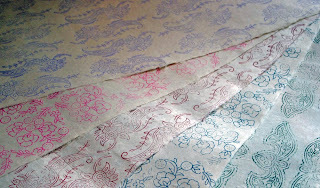 Sarah has been busy making hand printed wrapping paper, using one of old fabric printing blocks. One was printed in dark blue ink, and the other in dark red ink on large sheets of handmade Lotka paper from Nepal. She's really pleased with how they turned out, and the blue paper has already been used to wrap up presents! The red version is in the Etsy shop now. We have been out in the garden enjoying the sunshine this week, plotting new ideas for various prints and keeping a close eye on all our little vegetables. Today we harvested our first pea pod! Hooray! 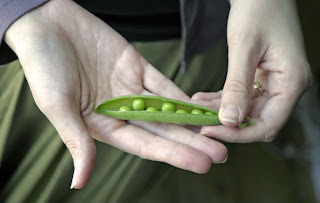 It was a Hurst Green Shaft, and it was delicious - why bother cooking fresh peas when you can just eat them straight out of the pod? Like green smarties, only better. 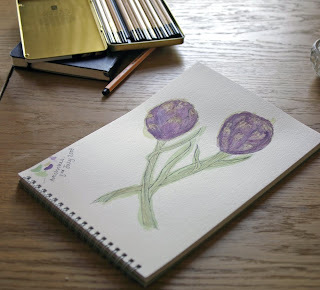 Inspired by all this vegetable growing I did a quick watercolour sketch of some artichokes yesterday (not grown by us, but bought from the local farm shop instead). We've been trying to decide what kind of print we could turn my little painting into - Jon thinks it would make a good wood engraving on one of our tiny little 2 inch blocks, and I think it would make a nice woodcut. I think we might end up doing both! This week I have been slowly re-scanning some of our prints and taking some nice new photographs of them to add to our Etsy listings. 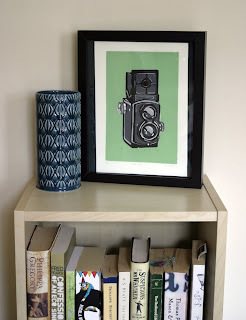 It's a slow process, and the only one I've done so far has been the green TLR camera print, which I think looks rather nice on top of our new bookshelf. The new improved listing is here, and more will follow in the next few days! 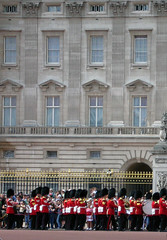 We had a jolly day out in London on Monday - Jon had a work meeting, and the office is right next to St James' Park, we followed the sound of the band up to Buckingham Palace and watched the Changing of the Guard (from behind a very large crowd of eager tourists). 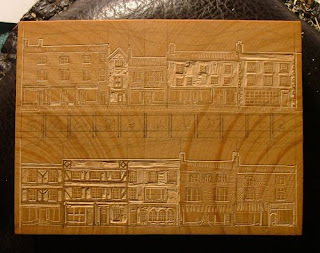 Whilst I'm beavering away on jazzing up our Etsy shop Jon has been busy working on a new wood engraving. At the moment he's still sketching the design onto the block - more photos to follow before he starts cutting!